Cascading Art-Deco styled diamond drop earrings, featuring a groups of 4 diamonds arranged across three diamond set strands. 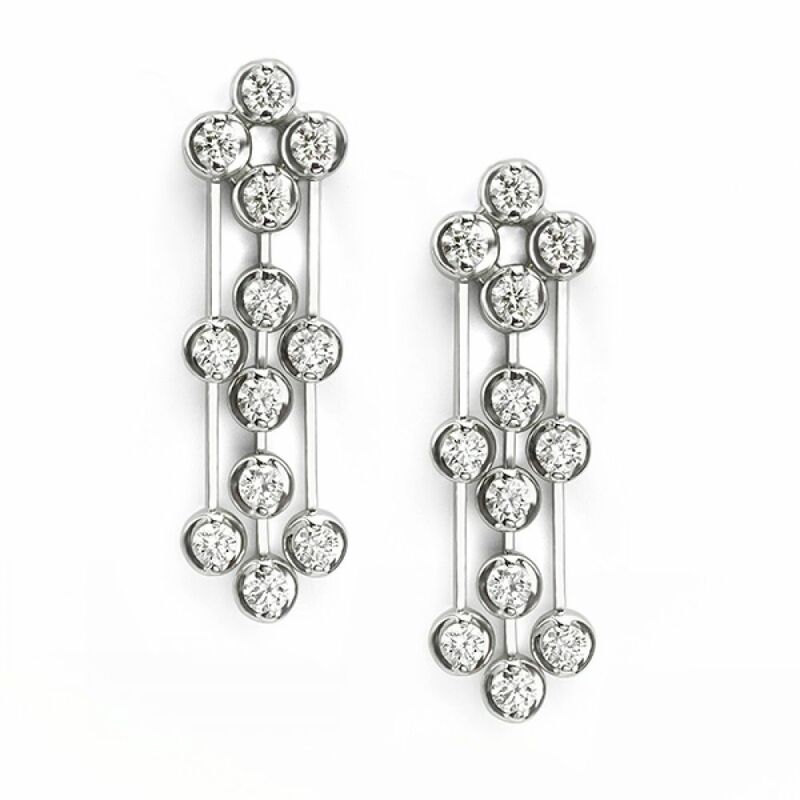 Experience the movement and delightful sparkle from the Art-Deco Diamond drop earrings. Set with 0.50cts of Round Brilliant cut Diamonds, this elegant pair of earrings dangle from the ear with incredible movement. Brilliantly faceted, natural Diamonds group together across adjoining strands which cascade from the ear. The Diamonds within this piece have been graded G Colour VS1 Clarity. The Art-Deco drop earrings make the perfect accessory for evening wear with their decadent dazzle. Beautifully boxed, your earrings will arrive by secure courier to your door. We ship Worldwide from our UK showroom where we typically have this design available for immediate purchase. Each earring measures 3cm in length by just under 1cm in width. Please contact us for any additional information on any of our earring designs. The Art-Deco diamond drop pendant is perfectly matched to the Art-Deco diamond drop earrings. Crafted in exactly the same style, the pendant size is slightly larger to the drop earrings. Measuring just over 3cm in length, the pendant cascades from the 18" curb chain included. Beautifully boxed, each pendant is beautifully presented.